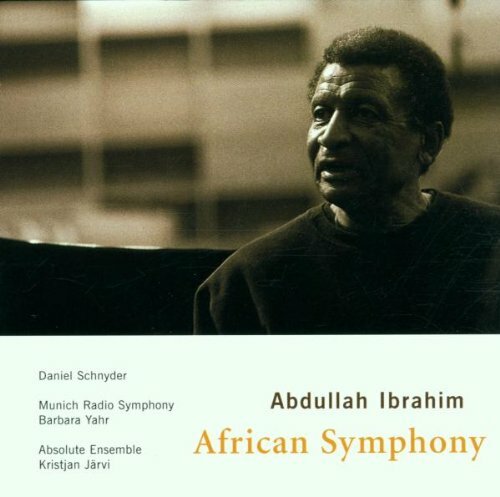 African Symphony continues the German Enja label’s apparent obsession with capturing the great South African pianist and composer Abdullah Ibrahim in posh settings. Following various big band, string orchestra, and live treatments of his songs, the producers here surround him and his trio (including bassist Marcus McLaurine and drummer George Gray) with the Munich Radio Symphony. Classical listeners may well find much to enjoy in Swiss jazz-classical artist Daniel Schnyder’s arrangements and Barbara Yahr’s direction of the 70-piece orchestra, but as atmospheric and thoughtful as the music is, the rhythmic charms and ethnic accents of Ibrahim classics such as “Tintinyana” get chased from the room. A devotee of Duke Ellington and Thelonious Monk, Ibrahim writes great, insinuating melodies, but they can’t hold up here under the weight of all those players. The album also includes a Schnyder original performed by the Absolute Ensemble under the direction of Kristjan Järvi.